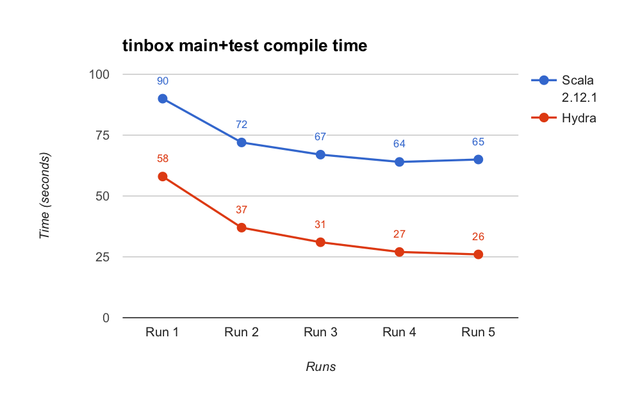 When launching an application, the JVM starts by loading the required classes and interpreting the code, and as it runs it starts just-in-time compiling and optimizing the code paths that are taken more often. We call a JVM that isn't optimized yet a "cold" JVM, while a JVM that is optimized is referred to as “warm”. Because Sbt is used to compile the project, you can warm-up the JVM by entering the Sbt interactive shell and executing a few full compiles. 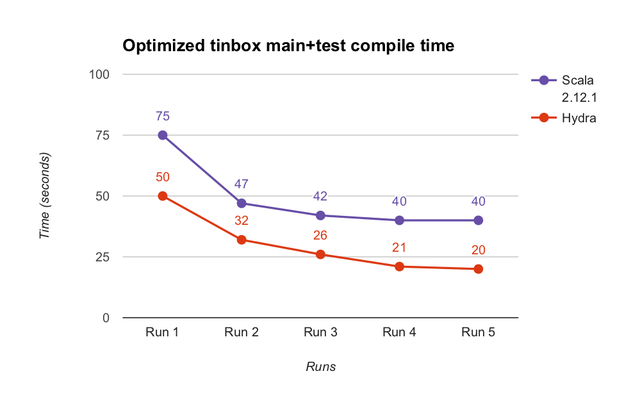 In fact, you will immediately notice that your sources take considerably more time to compile the first time, and that’s indeed because the JVM is initially “cold”. 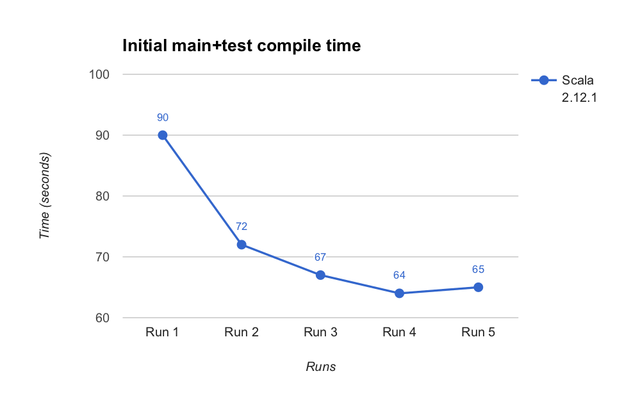 The reason why it’s interesting to collect both “cold” and “warm” compile time is that when sources are compiled on a Continuous Integration (CI) server, we usually observe a “cold” compile time. 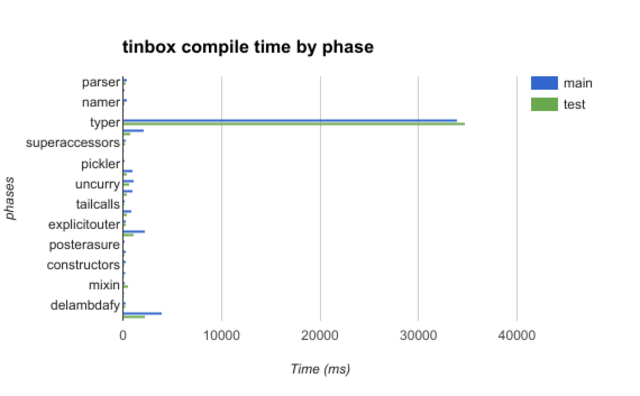 When a developer compiles on their own machine, he or she will observe a “warm” compile time. There are clear productivity benefits in reducing both “cold” and “warm” compile time. After all, the less one needs to wait, the more productive one can be. All experiments were run on a Macbook Pro (Retina, late 2013), 16G, Intel(R) Core(TM) i7-4960HQ CPU @ 2.60GHz, using Scala 2.12.1 and Java 1.8.0_112, and giving Sbt 4G of memory (using the JVM flag -Xmx4G). The one phase that you should pay attention to is [typer], as it takes in both cases more than 34 seconds to execute. This means typechecking accounts for more than 60% of the whole compile time, which is definitely atypical. 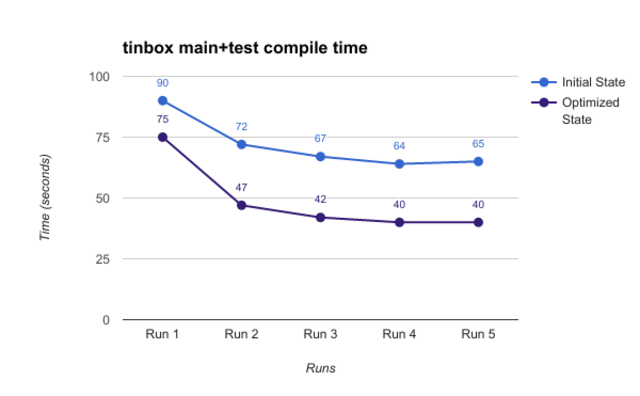 Because the tinbox project uses several type-intensive libraries, it is not entirely surprising to find out that typechecking sources takes time. However, it was remarkable that the typechecking time for test sources was so long, considering there were less than 5k LOC. Hence, the decision to take a closer look at the test sources. If you’re interested in finding out more about our compilation time improvements, I’d be happy to chat! Get in touch via Twitter at @etorreborre. Job ID: 1549368 | updated on 10-04-2019 Engineering & Development Dublin Zalando Ireland Ltd.